Arsenal have the youngest set of players in the Premier League in the 2012-13 season when considering the ages of those starting league games so far. Arsene Wenger has used 14 different starters in the three PL games of the campaign – and their average age is 25.6 years, according to Sportingintelligence analysis. Only two other clubs have players with an average age below 26, and they are Liverpool (25.7 years old) and Aston Villa (25.9 years old). Wenger has long been an advocate of youth. At Liverpool there is now a stated aim of signing young, promising players. And at Villa? Well different circumstances appear to have forced the hand of manager Paul Lambert, who is apparently more reliant than recent predecessors on young players because owner Randy Lerner wants and needs to economise. Below is the table that shows the average ages of players so far by club. All clubs have played three games aside from Sunderland and Reading on two apiece before this weekend. 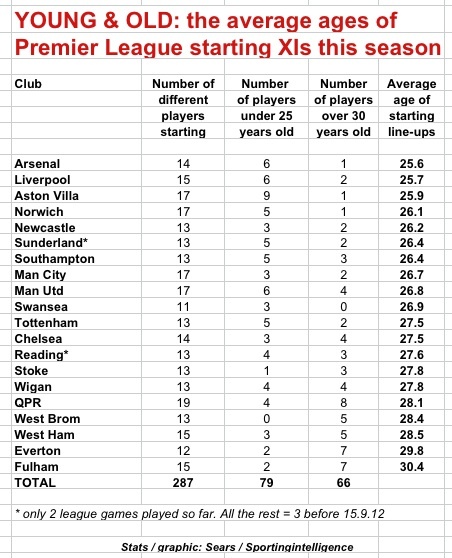 One technical note: the average age has been calculated for the 33 starters (3 games times 11 players) at most clubs, and for the 22 players at Sunderland and Reading. With Arsenal, Liverpool and Villa backing youth at one end of the table, we can see Fulham and Everton at the other extreme, relying on older, more seasoned personnel. The 30-something Fulham team are the only side with an average starting age above 30. Everton have only used 12 different players to start their games and seven of them are already in their 30s. But the Fulham team that lost 0-3 at West Ham is the oldest so far starting this season: seven of that 11 were in their 30s and their average age worked out at 31 years and five months. On Merseyside, where Arsenal began the season against Liverpool, only three of the 22 players kicking off were in their 30s: Reina and Gerrard for Liverpool, and Arteta for Arsenal. At the same time, Anfield that day saw two of the three teenagers who have so far started Premier League games this season: Sterling (Liverpool) and Oxlade-Chamberlain (Arsenal). The other teenager to have put in a starting appearance is James Ward-Prowse for Southampton. Remarkably Ryan Giggs, yet to put in a starting appearance this season, had already played 80 games for Manchester United and scored 14 goals before any of that trio were born. Those with a statistical eye will spot from the table above that Swansea are the only team to have trusted their starting line-up in all three games to the same 11 players. Sadly the injury to Neil Taylor ruins any possibility of that being continued. Everton have used as few as 12 players. QPR have used the most individuals to start their three games (19), followed by Villa, Norwich and both Manchester clubs (17 each). Some 287 different players have started Premier League games, with the three teenagers representing one per of them. At the other extreme, nine starters (or three per cent) are beyond their 35th birthdays (or ‘retirement age’ for a footballer, 35 being the normal age for collecting a PFA pension).